Beautiful tea / coffee set composed of 18 pieces. 6 cups, 6 saucers and 6 side plates. 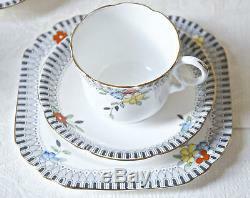 The set features a meadow flowers motif on white background and black details. Gilding at brim and handle. Some flower details appear to be hand painted. Ideal for tea & coffee lovers, tea party, afternoon tea, housewarming, festive holidays, family dining, weddings. Collectible set in Art Deco style, for use or display. Very good vintage condition: colours bright, no chips or cracks. Gilding good but may be slightly faded in places. One of the side plates has some age marks on the top. Base Mark: "Durance" Quality English Bone China. Price is for the 18 pieces set. Teacup: 7 cm / 2.75 inches tall. 8 cm / 3 inches in diameter excl. Saucer: 14 cm / 5.5 inches in diameter. Side Plate: 17 cm / 6.5 inches at the narrowest point. 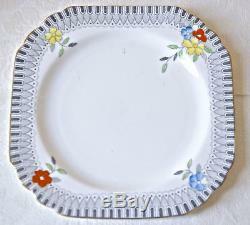 This china is vintage, therefore will have been pre-owned and possibly used. Your item will be packed with the utmost care. The item "18 pcs TEA COFFEE SET. 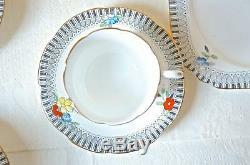 Vintage Art Deco English bone china. Family dining party" is in sale since Monday, March 25, 2019. This item is in the category "Pottery, Porcelain & Glass\Porcelain/China\Other Porcelain/China". The seller is "travelling_judith" and is located in London. This item can be shipped to all countries in Europe, United States, Canada, Australia.